Most of us find evangelism hard, but there is no greater joy than seeing people come to Christ Jesus. This realistic and humorous book by Rico Tice will help prepare and encourage you to be honest and bold in your evangelism, presenting the gospel fully and properly, even when it's tough. 2. So why talk about Jesus? 6. What do I say? I try to regularly read books on prayer and evangelism, because both are so vital to Christian maturity and both are so difficult. 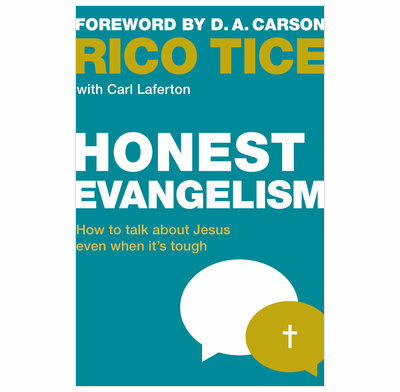 The strength of this book is that Rico does lots of personal evangelism, and yet, he is very honest about how personal evangelism is still a struggle for him. A short book full of good encouragement. A good and timely book that is rich in wisdom, grace and guidance. Challenging, liberating and above all encouraging. Read it ! I read this through in one sitting - it is realistic, challenging and wonderfully helpful. I am anxious to get this book into the hands of my congregation. I couldn’t be more excited about this hard-hitting, honest book on personal evangelism. As one who is petrified on door to door work, I found Honest Evangelism reassuring - and very honest and realistic. I gave a book review in church and got 4 takers. The book is not glib, but refreshingly honest. I borrowed this book from a friend and read it on holiday this week. I will be ordering one for myself as it is so good. Whilst being down to earth and very practical, the author backs up his thoughts with scripture and reminds the reader of the joy of heaven in seeing people come to Christ. It deals with crossing the "painline" the things that hold us back from evangelism, and offers insight on what to say and expect when witnessing. I found myself challenged and having to put the book down to pray about things and picking it back on with a renewed mind. This book will fuel your faith. It may cause you to leave your comfort zone and share the glorious gospel with the lost. In this short book, Rico Tice winsomely shows us from the Bible: motivations to share our faith; obstacles to sharing our faith; a simple method for trying to do so; and the honest realisation that sharing our faith in a hostile culture is hard work. This book is well worth your time and serves as a brilliant starting point for helping the family of God to share the news of our great Saviour and King. A good book, generally very practical and down to earth. Some very helpful ideas and suggestions. An easy read and very lively, but perhaps doesn't allow for all Christian personalities and their way of doing things. Although it tries to be relaxed and not frantic, perhaps it leaves us with a sense of guilt or inadequacy that is not entirely justified? Rico doesn't say much about waiting for a response from, particularly, more mature people, who are unlikely to respond positively to a 'pushy' approach and you may have to wait a long time for them to have confidence in you, or have a sense of need that they think you may be able to help with. Younger people are much more trusting more quickly and are aware that they don't have the answers to life, so may be prepared to respond to an approach from a believer more quickly. Rico's example of his dying grandmother, while sad and very serious, and which enabled him to point up an idol in his own life, is none the less not something he should unreasonably beat himself about. She almost certainly knew of Rico and his brother's views and had rejected them. These things are in the Lord's hands. I liked the emphasis on the seriousness of witness and the need of unbelievers with the outcome for them being Hell if they do not repent. We need to keep this continually in mind. I would recommend this book as a stimultating read and challenge, subject to the provisos made above. This book and the ideas put forth by the author have renewed my confidence about witnessing to others who may be hostile to the gospel. We don't have to be a full time evangelist, have a brilliant mind, or know all the answers. Tice makes it plain again and again that it is not our job to save people, but it is God's. All God asks of us is that we be willing to cross the painline, and be available to speak to others as we go about our daily lives. We can be ourselves fully and do this! Thank you Rico Tice for the encouragement! 'Honest Evangelism' is a book about overcoming evangelism phobia. Some books on evangelism are discouraging because they pile on the guilt, but Rico has a disarming ability to motivate as well as diagnose. The end result is an immensely readable book - at times funny, at times challenging, at times deeply personal - that not only led me to a greater understanding of why I often find it hard to witness, but also how I can become more effective. If you (like me) find it hard to 'cross the pain line' and speak up about Jesus, you will find this an immensely helpful book. Rico nails it. Talking about Jesus in a culture that is increasingly hostile to the Christian message will be costly & painful. This great little book tackles that head on. Yes, it is tough but it is worth it & God is still the one saving the lost. I look forward to giving away many copies of this book. I was encouraged myself to put into practice many of the ideas here. Thanks Rico & the Good Book Company - a great resource! Rico Tice, founder of Christianity Explored Ministries, has written a book on evangelism that is short and to the point. He explains what evangelism is, the reasons we find it difficult, whose job it is and what an evangelist is (you might be surprised in chapter 6). Rico reminds us that there is hostility to the gospel but there is also a hunger for the gospel. But, he says, when we just 'say enough to salve our consciences - we talk about church, or Jesus' love, or how great it is to pray', we don't say enough to help people to be saved. We need to talk about the hard stuff - sin, death and hell. He explains what we need to say to share the good news. I'm not going to give all the answers away, suffice to say, if you've done the Christianity Explored course, it will ring some bells. Ask questions, chat your faith, pray for God to work in this person's heart, invest in the relationship. Read the book. It's short, it's punchy, it's to the point. It's honest about evangelism.